Tough new security restrictions on flights to the U.S. could deal a major blow to big Middle Eastern airlines already reeling from President Trump's travel ban. Emirates Airline, Qatar Airways and Etihad Airways are among 10 airlines which must now prevent passengers flying from the Middle East to the United States from carrying almost all types of electronic devices in the cabin. Smartphones will still be allowed but any larger items -- such as iPads, Kindles and laptops -- will have to be checked in before passengers clear security and board their flight. The rules come into force on March 25. The big three Gulf airlines said they would comply with the directive but declined to comment publicly on its impact. The trio will not be affected, however, by similar restrictions announced by the U.K. on Tuesday that also omitted their home airports of Abu Dhabi, Dubai and Doha. But the carriers are clearly worried about the measures imposed by the U.S.
A senior executive at one of the Gulf carriers told CNNMoney that he was watching bookings closely, and expected them to fall away once news of the electronics ban spread. He described the decision by the Trump administration as "very unfair" and unwarranted. There's a huge amount at stake given the rapid growth Gulf carriers have enjoyed recently in the U.S. Earlier this year, Emirates announced a new service between Dubai and Newark, with a stop in Greece, giving the airline its 12th American destination. Qatar Airways will service 11 destinations in the U.S. once its new Doha-Las Vegas service starts in 2018. The airlines will have to figure out how to apply the new restrictions, and bear the additional cost or pass it onto passengers. "The cost of added security measures, delays in flights because of passenger compliance or check in delays... will add to their costs and have a roll over effect where someone has to pick up that tab," said Saj Ahmad, chief analyst at StrategicAero Research. They also risk losing frustrated passengers to other carriers not affected by the ban. Syed Hussain flies regularly between the U.S. and the United Arab Emirates on business and spends about 10 hours of the 16-hour flight on his laptop. "I'm going to be seriously impaired in my ability to work without a laptop," he told CNN. 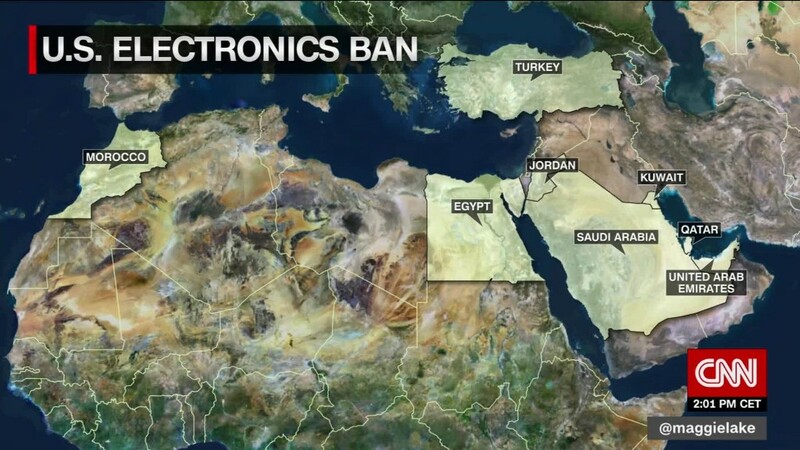 The electronics ban -- introduced because of terrorism concerns, according to senior officials in the Trump administration -- comes at a tricky time for the region's carriers. Trump's travel ban in January, which temporarily barred citizens of seven Muslim-majority countries from entering the U.S., caused a huge headache for the airlines after its chaotic roll out. Emirates said the rate of bookings to the U.S. dropped 35% overnight following the ban. That ban was blocked by U.S. courts and has since been superseded by a revised version. But many people are still thinking twice about visiting the U.S.
For years, Gulf carriers have been at odds with their American rivals, who have accused them of benefiting from subsidies. The CEOs of Delta Air Lines (DAL), United Airlines and American Airlines (AAL) wrote to Secretary of State Rex Tillerson last month to complain about the "massive subsidization" their Gulf rivals. They urged Trump to review agreements that allow Emirates, Qatar Airways and Etihad to fly from the UAE and Qatar to any U.S. destination. Both nations are "abusing the agreements, and our government has done nothing to stop them," the CEOs wrote. A senior U.S. official denied the latest measure was in response to alleged unfair practices by the Gulf carriers. The electronics ban was based on intelligence that "indicates terrorist groups continue to target commercial aviation" by "smuggling explosive devices in various consumer items," senior U.S. officials said. They declined to provide specific information on the threat or why particular airlines or airports were selected. "The ban is probably based on risk factors that Department of Homeland Security uses in its risk management program for countries and their operators," said Michael Daniel, managing director at Aviation Insight and a former Federal Aviation Administration senior manager. "As it seems to be targeted certain operators, it appears to me that DHS may may be reviewing safety and/or security data that is not available to the general public." -- Richard Quest and John Defterios contributed to this report.